Find useful definitions of many terms related to materials testing below. If you have a suggestion for a definition, feel free to contact us! Ductility is defined as the ability of a material to deform plastically in tension or shear before fracture. Its measurement is of interest to those conducting metal forming processes (ex. automobile body panels); to designers of machines and structures; and to those responsible for assessing the quality of a material as it is being produced. Two measures of ductility are Elongation and Reduction of Area. Elongation is defined as the increase in the gauge length of a test piece divided by the original gauge length. Reduction of Area is defined as the decrease in the cross sectional area divided by the original cross sectional area. The conventional means by which these ductility measures are obtained is by pulling a specimen in tension until fracture. ASTM E8 governs the determination of Ductility measures for Metals. A punch is often used to apply the gauge marks to each specimen. The change in gauge length, ΔL, is determined by carefully fitting the ends of the fractured specimen together and measuring the distance between the gauge marks. In reporting Elongation, both the original gauge length and percentage increase are to be reported. 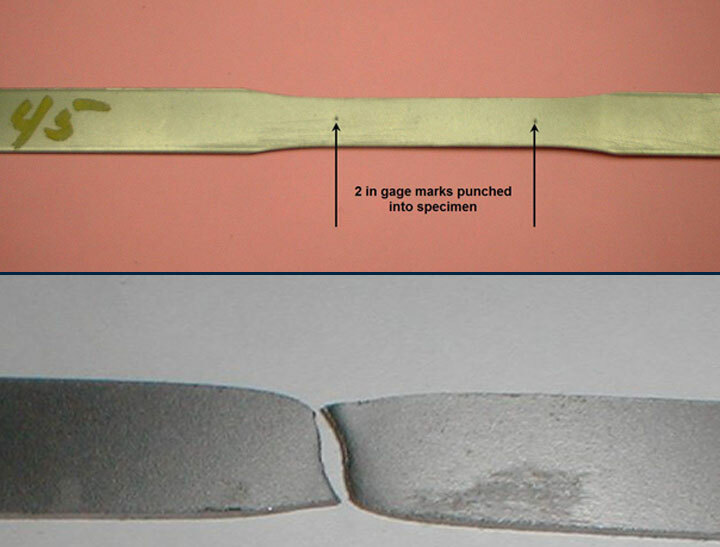 If any portion of the fracture occurs on or outside a gauge mark, Elongation may not be representative of the material. ASTM E8 governs the determination of Elongation for Metals. Engineering Stress (ES) is equivalent to the applied uniaxial tensile or compressive force at time, i divided by the original cross sectional area of the specimen. 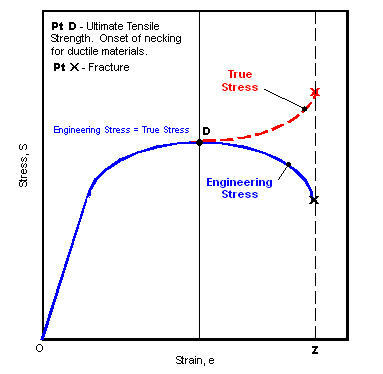 True Stress (TS) is equivalent to the applied uniaxial tensile or compressive force at time, i divided by the cross sectional area of the specimen at time, i.
Ductile materials undergo plastic deformation prior to rupture or break. When a ductile material is loaded beyond its Ultimate Tensile Strength, necking occurs and the cross sectional area and applied force both decrease. 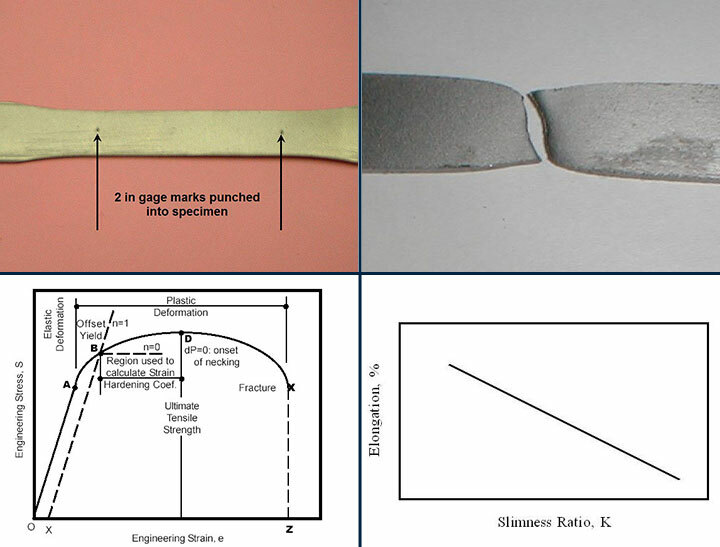 Thus, the Engineering Stress which is based on the original area decreases beyond the Ultimate Tensile Strength, whereas the True Stress increases, due to the necking or reduction of area that occurs to the specimen cross section. Once the applied stress exceeds the proportional limit (pt A) of an elastoplastic material, the linear stress strain response transitions to a non-linear relationship. If the stress applied to a material never exceeds its proportional limit, then the specimen will return to its original length when all forces are removed. If the applied stress exceeds the proportional limit, then the material will have a permanent set and will not return to its original length. The stress at which the onset of permanent deformation occurs is referred to as the proportional limit and is indicated as point A in the figure. The portion of the stress strain diagram prior to the proportional limit is also defined as the elastic region and beyond the proportional limit the plastic region. A stress strain curve relates the forces on a member to the deflections imposed by the forces. An XY graph of force versus deflection is one way to depict this relationship. When the size of the member is changed, however, a new graph will need to be drawn. Expressing the relationship in the form of a stress strain curve eliminates the need to redraw the graph each time member dimensions are changed. Stress is obtained by dividing the applied force by the original cross sectional area of the member. Strain is obtained by dividing the change in length of the member by its original length. Stress strain curves are frequently generated by universal testing machines equipped with an extensometer. The testing machine is used to load the member to failure and record the stress versus strain relationship. 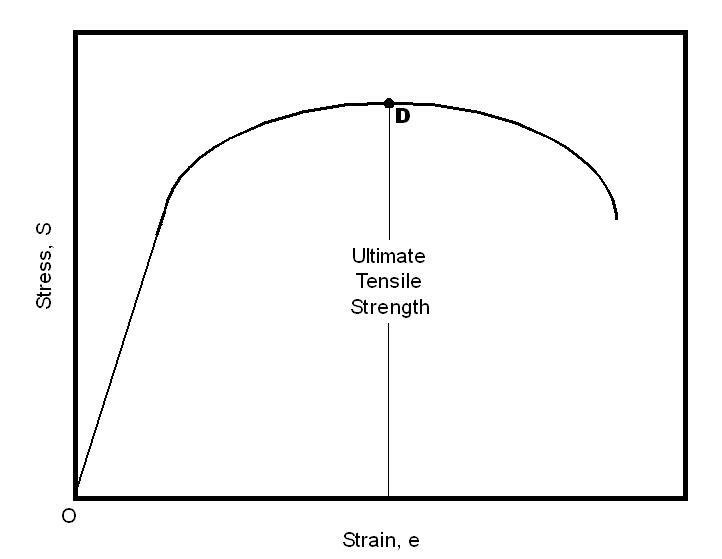 The maximum stress applied in tension to a material before rupture is defined as the Ultimate Tensile Strength (UTS). Ultimate Tensile Strength is commonly reported in units of pounds per square inch (psi) or in Newtons per square mm (MPa, Mega Pascals). ASTM E8 governs the determination of Ultimate Tensile Strength for Metals. ASTM D638 governs the determination of Ultimate Tensile Strength for Plastics. The Yield Point is the stress at which there is an appreciable increase in strain with no increase in stress, with the limitation that if straining continues the stress will again increase. Few materials possess a Yield Point, the most common examples are low carbon steel. 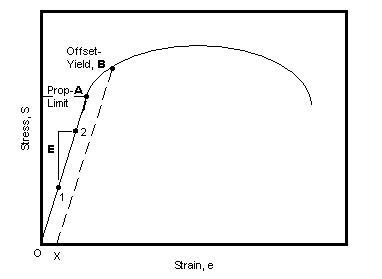 If Yield Point (pt A) exists for a given material it will be indicated as the point on a stress strain curve where a zero or negative slope occurs prior to the Ultimate Tensile Strength. In the figure, point A indicates the Yield Point for 0.11%, 0.32% and 0.62% carbon steel. 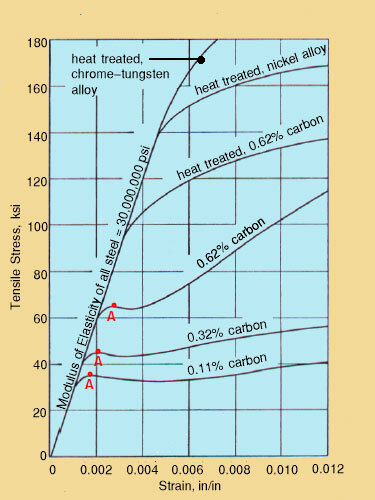 Notice from the figure that the heat treated and higher carbon steels do not exhibit a Yield Point. ASTM E8 governs the determination of Yield Point for Metals. 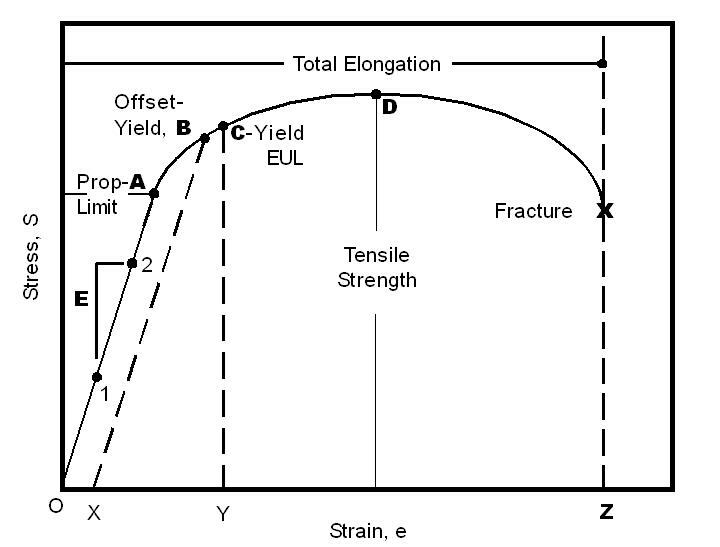 The Yield Strength is defined as the stress that will induce a specified permanent set, usually 0.2%, which is equivalent to a strain of 0.002. The Yield Strength is useful for materials with no Yield Point. The Yield Strength can be determined from a stress strain diagram by laying off the specified offset OX on the strain axis and drawing a line XB parallel to OA. The stress indicated by the intersection of XB and the stress strain diagram is the Yield Strength (pt B). ASTM E8 governs the determination of Yield Strength for Metals. ASTM D638 governs the determination of Yield Strength for Plastics. Need to discuss your material testing application with an expert?